John Amatt is Founder & President of One Step Beyond WorldWide, an innovative educational and motivational company, whose mission is to encourage people to push beyond their self-imposed limitations, to be more personally accountable for the results of their own actions, and to embrace effective teamwork by valuing the contribution of others. In this capacity, he has delivered more than 1,800 presentations and seminars in 48 countries and has been called “The World’s Best Adventure Speaker”. A native of Great Britain, for the past 35 years he has been a resident of the Canadian Rocky Mountains and is the Founder of the Banff Mountain Film Festival, widely recognized as the world’s premiere showcase of adventure documentary films. John is renowned in the international mountaineering community for making the first ever climb of Europe’s highest and steepest mountain face – the 5000 foot “Vertical Mile” Troll Wall in Norway. He was leader of an early climbing expedition to Western China, which used camels to approach a 25,000-foot mountain before skiing to the summit, this being perhaps the highest peak in the world to have been ascended and descended entirely on skis. And more recently, he was the principal organizer and a leader of Canada’s first successful expedition to reach the top of the world – the 29,035 foot summit of Mount Everest – a climb that was televised live throughout Canada and on ABC Nightline in the United States. 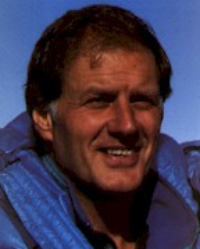 John Amatt is perhaps somewhat unusual amongst Adventure Speakers in that he did not reach the top of Everest on his celebrated expedition. Instead, he was a leader of a dedicated team that suffered four tragic deaths in two unpredictable accidents before placing six climbers on the peak. John’s mission in going to Everest was to place one of his team on top of the world’s highest mountain. In his own words … “It didn’t matter who reached the summit, because we believed that when one person stood on the highest point, the whole team had achieved the goal. I was totally fulfilled the day we reached the top and I would never go back to Everest, because my expectation as leader had been fully met”. John Amatt is a superb storyteller, who has delivered highly motivational presentations to some 1,800 audiences in 45 countries worldwide. After a career of 25 years, he is one of the world’s most successful adventure speakers. An educator by training, he uses the lessons learned from his own life and death adventures in the world’s most remote places to articulate down-to-earth strategies for meeting the challenges of challenging times. John is the Founder of the world-renowned Banff Mountain Film Festival, Founder and President of One Step Beyond WorldWide, and has been called “The World’s Best Adventure Speaker”. Change is inevitable … and increasing! Rapid and radical change is the primary challenge facing corporations and professionals today. We cannot stop this change, nor can we ignore it. But we can increase our ability to adapt, to manage change effectively, and to benefit from the numerous opportunities that change creates. In these rapidly -changing times, the metaphor of adventure is the perfect vehicle for articulating the strategy that will help us address this challenge. By definition, adventure involves dealing with the uncertain, the unpredictable and the unknown, just as change involves moving towards a future in which there are no guarantees. To succeed in the uncertain world of the 1990’s and the 21st century, we must learn to embrace change, and to become visionary and adventurous in dealing with the economic, social, and political environments in which we must all operate. Straight to the Top and Beyond will motivate your staff to embrace new opportunities in a changing world, to open up their minds to new realities, and to develop the “Adventure Attitude”™ strategies that will be the key to success in the future.